Poach the chicken breasts in slightly salted water for about 10 minutes until cooked through and then either shred using 2 forks to pull apart or cut into smallish cubes. Boil or steam the broccoli until cooked, you don’t want them soft, there should still be some crunch in them and drain. In a bowl add the shredded chicken, broccoli florets, cream of mushroom soup, mayonnaise and mustard and combine. Season with black pepper. 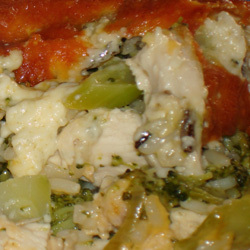 In a casserole dish, add the cooked pasta and cover with the chicken and broccoli mixture. Use 2 spoons to mix gently, much like tossing a salad. Cover with the grated cheese and breadcrumbs and place in a 200 Celsius oven for about 20 minutes or so until the cheese toping is golden brown. It’s easy to make for many people and served with an easy dessert like sticky toffee pudding using a bought cake couldn’t be simpler to please a whole load of people. Place the chicken mince in a bowl and add all of the ingredients except lemon juice. Mix together well with a spoon or just dive in there with clean hands and mix together well. cover and set aside in the fridge while you prepare whatever vegetables you are going to eat. i had a cuppa tea before I started the veg and the mixture was in the fridge for about 1/2 an hour. 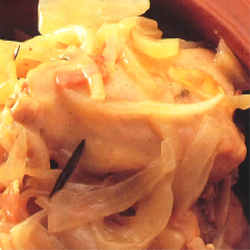 You want to let the flavours linger before you cook the chicken. Cook them until they are nicely browned and serve with a squeeze of lemon juice, either with stir fried vegetables or a salad. As a starter serve them with a sweet chili dipping sauce. Lightly beat the egg whites, add the cornflour and whisk well until completely combined. Add the chicken strips and mix until they are all covered in the batter. Take the strips from the batter individually and drop into the oil. Allow them to cook until golden brown and crisp. Remove from the oil and drain on kitchen paper. Place in a low oven to keep warm. Wipe the wok clean, add the water, lemon juice, grated ginger, honey, sugar and crumble in the chicken stock cubes. Give it a good stir and bring it to the boil. Now combine the maizena and 1 tablespoon of water together then add to the sauce, reduce the heat and stir constantly until the sauce thickens. Simmer for about 2 or 3 minutes to cook the maizena. Remove the sauce from the wok and set aside. Last part… Wipe the wok clean again and add a little oil to the wok, add the sliced ginger and stir fry for one or 2 minutes. Add back the sauce and simmer for another 2 minutes. 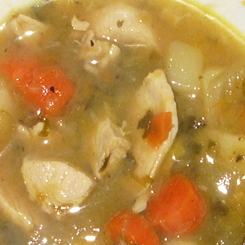 Place the chicken pieces in a bowl and pour over the sweet lemony nectar. Garnish with a few sliced spring onions. In a pan on a medium heat add the bacon pieces and onions, cook until the bacon is well done and the onions are browned a little. Remove and set aside. 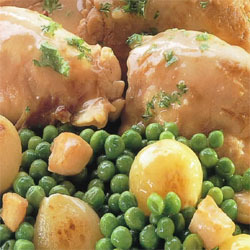 In the same pan, add the chicken pieces and brown on both sides, remove and place in the bottom of a casserole dish. Now add the butter and the flour, cook for a minute or 2, don’t allow the flour to burn. Add the chicken stock to the flour and butter mixture and stir vigerously until well blended. Cover the chicken pieces with the bacon and onions, then pour over the stock and flour mixture. Cover and place in a pre heated 200 celsius oven for 30 minutes. Now add the peas and the parsley, stir and place uncovered in the oven for a further 10- minutes. Thats it, you have a fantastic meal. Serve as is or with mashed potatoes. For garlic lovers, you can happily add 2 teaspoons of garlic to the bacon pieces. Try the bread and butter pudding to really top this off. Sprinkle the flour over the chicken and toss around with your hands to coat, use a little more flour but not more than 2 tablespoons if need be. Heat your oven to 180 Celsius and have a casserole dish ready. 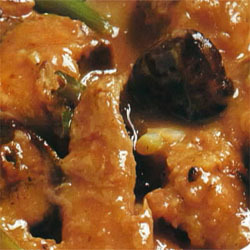 Heat a little oil in a large pot and brown the chicken pieces, remove and place in the casserole dish. Wipe the pot with kitchen paper and add a touch more oil, cook the onions, fennel and garlic until beginning to brown on the edges. Add the tomatoes, beans, rind and juice of the orange, bay leaf and finally season with a pinch of salt and pepper. Stir it around, pour over the chicken pieces, cover and place nto the oven for 45 minutes. Thats it, serve with crusty bread and enjoy. The chicken and tomato casserole is really quick and easy, if you like this type of chicken recipe. 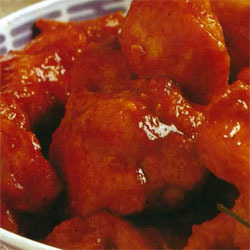 Mix together the tomato sauce, wine and soy sauce in a seperate bowl and set aside. Place all of the chicken pieces into the egg yolk and mix around to coat thoroughly. Take individual pieces of chicken from the egg and place into the oil. (you want each piece to be separate) Do this in small batches, until all all of the chicken is golden brown, remove from oil and drain on kitchen paper. Remove all of the oil of the wok and wipe down. Place the sauce into the wik and bring to the boil, allowing it to boil for about a minute and reduce slightly. 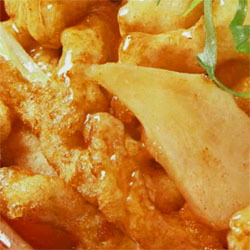 Toss all of the chicken pieces into the sauce, mix well to coat and heat through. Put about 1/2 cup maizena on a plate to coat the chicken. Heat about 75ml oil in a wok. Coat each chicken piece in Maizena and place them in the oil in 2 batches and fry until golden brown, remove and set aside. Once all the chicken is browned add back to the wok and add the ginger slices, spring onions, garlic and mushrooms and toss around. Combine the 1/4 cup chicken stock, white wine, soy sauce and 2 teaspoons of maizena together and add to the wok, stir until the sauce begins to thicken and remove from heat. Pour the whole lot into a casserole dish, add the last 1/2 cup of chicken stock, cover and place in a 180 celsius oven for 30 minutes. Serve straight out of the oven with rice or noodles. 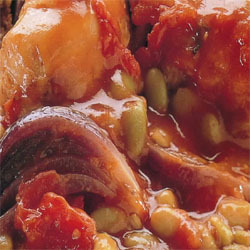 The sauce is thick and delicious and is sure to become a favorite. Place the sliced eggplant(1cm thick) onto a plate and sprinkle with salt on both sides to draw out some of the bitterness. leave for 30 minutes while you repare the rest of the ingredients. Rinse under cold water and pat dry with a clean cloth or paper towel. Make a marinade by placing the garlic, lemon juice, olive oil and mint into a bowl, mix and season with a pinch of salt and a good grind of black pepper. Slice the chicken breasts through the center to form 8 thinner pieces. (you can also cut into strips diagonally across the grain). 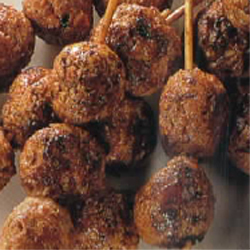 Place them in a bowl and pour over 1/2 the marinade ensuring that each piece is coated and set aside. 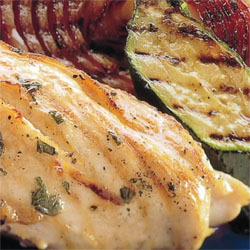 Heat a grill pan to medium hot and grill the vegetables until they begin to soften and have begun to brown slightly. Do the same with the chicken pieces and serve immediately. Never overcook chicken, you want it to just cook through and it will be tender and delicious. If you liked this recipe you will really enjoy the chicken and sweet pepper stir fry.